Spot the difference between the two of us?! Can you see any?! Or it's hard to find since the two of us really look alike?! Ladies and gentlemen, meet Albie and RB! With so many similarities, Albie and I look almost the same! Yeah, we are twin brothers! 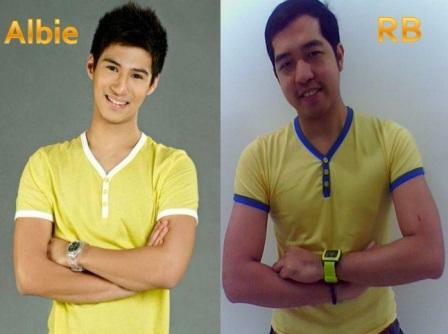 Albie and I are identical twins! Though we have only one face, we have different destinies or career path. As they say "isang mukha, dalawang tadhana...", we're it! Albie or Albie Casiño is today's hottest young actor who is said to be the father of Andi Eigenmann's baby! He rose to fame after playing the character of Christian in the phenomenal hit TV series remake "Mara Clara!" RB or Rocky Batara is yours truly! Do I need to elaborate more myself to you since you already knew me from the start?! If there's "The Sisters", then there's "The Brothers!" And if there's Javier and Alexander in "Minsan Lang Kita Iibigin," then there's Albie and RB here in "The Rock Land!" Hehehe...!! !